All India Majlis-e-Ittehadul Muslimeen (AIMIM) President Asaduddin Owaisi wrote a letter to Lok Sabha speaker Sumitra Mahajan saying the government was taking a hasty decision by agreeing to the '2+2' dialogue with the United States. 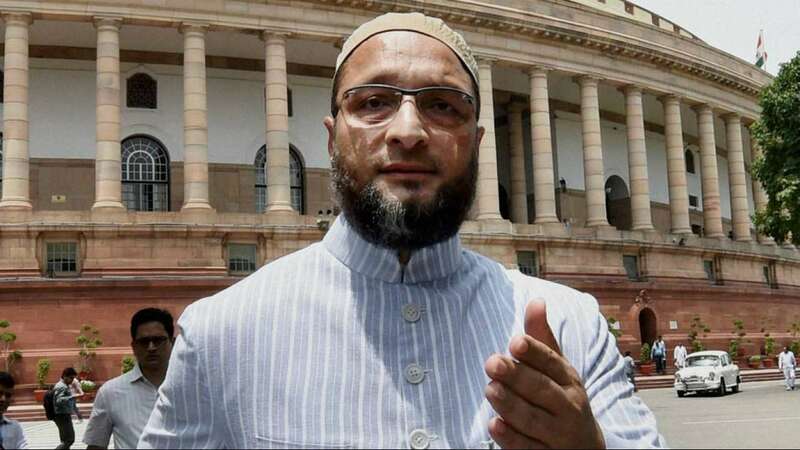 Owaisi, who wrote to Lok Sabha Speaker Sumitra Mahajan to move an adjournment motion, alleged that the Centre was "willingly relinquishing sovereignty to a foreign nation and compromising national security" by agreeing to sign a Communications Compatibility and Security Agreement (COMCASA) with the United States (US) during the upcoming '2+2' dialogue. "The agreement allows unfettered American access into encrypted Indian military communication systems and sharing of that data with others. Moreover, it allows US inspectors to visit Indian bases physically and inspect the transferred equipment. Finally, the agreement supersedes Indian law and this is a blatant compromise of the nation?s sovereignty," the letter read. "It has to be noted that previous governments in the last fifteen years have refrained from signing this agreement, being aware of its implications. That this government has decided to sign such an agreement with massive national security and sovereignty issues without any public discussion or feedback is shocking. This agreement needs greater scrutiny and deserves to be discussed on the floor of the Lok Sabha. Hence, I am giving the notice to move an adjournment motion to discuss this matter on an urgent basis," Owaisi highlighted. Pakistan's politics is important for peace to exist between India and Pakistan. If it's war we want then no matter who sits on the PM's char of Pakistan, he will just be ignored by both India and Pakistan's Army. Let's go into geo politics of war. There is no democracy in Pakistan rather it's pseudo democracy in Pakistan, democracy only for showing the world or rather aid giving nations majorly USA, UK, Europe that here democracy exists and they should pour their aid money to save democracy from TERRORISM(self created and administered) in Pakistan. Elections are the farse of Pakistan's Democracy with leaders selected by rigged elections on approval of Pakistan’s Army+ISI, if there is someone who isn't approved like Benazir Bhutto who was probably the biggest competition of then dictator/president/army chief Musharraf, they would be eliminated. Then after assassination of Bhutto this is what was reported.. Meaning Musharraf already knew about the bombing which would have resulted in another failed assassination attempt on Bhutto but because of carelessness she was engulfed in actual assassination!! Pakistan has many cases of military coup compared to most of other nations with 4 successful military coup and is just one military coup away from joining the elite group of top 10 nations with most number of military coup. 1953- Ghulam Muhammad the governor general of Pakistan dismissed the government of the Prime Minister Khawaja Nazimuddin who had the support of constituent assembly with the help of General Ayub Khan. = 12 years ruled. 1958- first Pakistani President Major General Iskander Mirza dismissed the Constituent Assembly of Pakistan and the government of Prime Minister Feroz Khan Noon appointing commander in chief Ayub Khan as chief martial law administrator. = 3 years ruled. 1977 coup (operation fair play) they f**king gave a code name for military coup.- Chief of Army Staff General Zia-ul-Haq, against the government of then-Prime minister Zulfikar Ali Bhutto. =11 years ruled. Not only these there are many failed or partial failled coup as well. So here is the hilarious fact of matter, Pakistani army ruled for 36 years in Pakistan after coup in 70 years of Independence but what is interesting is only three leaders were able to complete 5 years term as PM. Military Coup is good and all but what military brings is more poverty as most of all aid money comming for upliftment of downtrodden is diverted to military funding result is as blunt as you can imagine Pakistan is the only nuclear powered near failled nation in the world. Since army is almost in control their education system is one of the most deplorable in world, with next to zero higher end medical treatment facilities leading to Pakistani asking indian foreign minister to grant medical visas. There are very few industrial belts in Pakistan, what it has is dependent upon animal skin like leather industries and the automobiles are mostly all imported. Basically in shambles!! What this does is it creates unemployment and poverty which is very dangerous for an Islamic state like pakistan, yes TERRORISM it creates more human resources for TERRORISM and sadly Pakistan's Military uses state sponsored TERRORISM to attack innocent people in Afghanistan and India which is established fact and many times Pakistan's own leaders have accepted this ugly truth. Failed assassination attempt on PM Navaz Sharif who was going to visit this hotel, Marriott hotel.